With skill and precision,Dr. Grafman can usually painlessly spray away small cavities, without using anesthesia or a drill. ● A stream of air containing tiny particles is sprayed onto the tooth, breaking up decay and lifting away surface stains in the process. ● The pressure from the spray also removes plaque and debris, enhancing the condition and whiteness of your tooth. 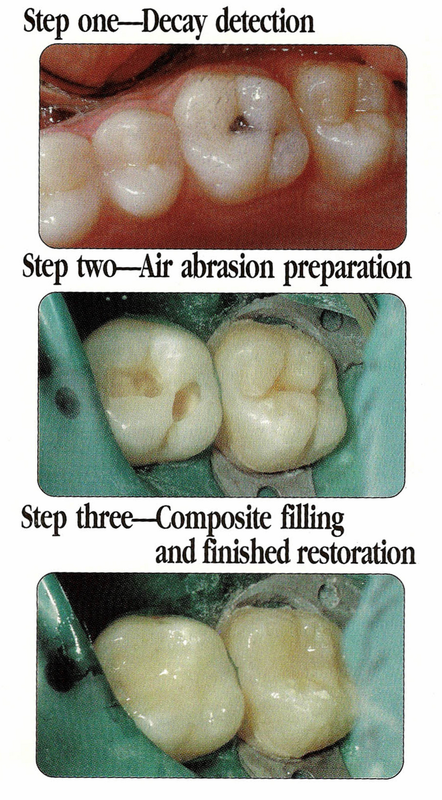 ● Air abrasion can also be used to repair and refinish older tooth-colored restorations instead of replacing them. ● The bonding procedure is usually completed in one visit. The first step is to remove the decayed or unsightly portion of the tooth, then the tooth is then etched with a liquid or gel and a bonding agent is then applied. You may be thinking,"No Needle, No Drill, this is too good to be true. How come every dentist in America is not using Air Abrasion?" The reason is that air abrasion can only be used for a limited number of procedures and its cost is relatively high. Dr. Grafman cares about the patients and their well being which is why air abrasion is offered at our office.